PXI and CompactPCI systems can either be equipped with a CPU card or can be remotely controlled by different extension systems from a standard workstation. Using this setup one combines the advantages of an industrial grade specified instrument housing with an individual and cost effective work station. 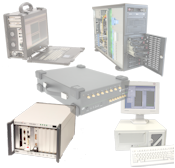 The same setup based on a standard Ethernet connection can be realized with the digitizerNETBOX products.